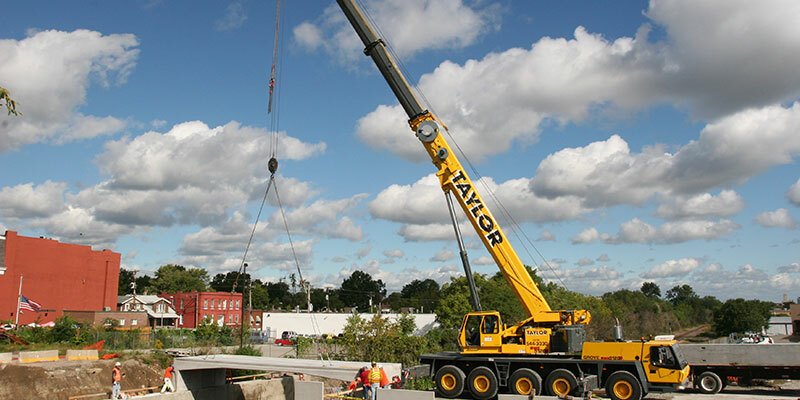 Taylor Crane Rental worked on the Arsenal Bridge update at Arsenal above the BNSF Railroad yards on Arsenal Street, just west of Jamieson Ave. in St. Louis. The western end of the old bridge had a sharp left-hand turn for westbound motorists. The replacement bridge is built on a straight re-alignment of Arsenal Street and is concrete stringer spans (balance of structure over railroad yard. There was also a stairway on the bridge’s southern face to allow access to a railroad yard security tower. The replacement bridge is heavily used by tractor-trailers to access the railroad yards a short distance south.